Dealers have turned the page on newspapers, at least when it comes to buying advertising in them. The annual National Automobile Dealers Association's state-of-the-industry report released last week highlights just how much their choice of advertising media has changed in the past decade. 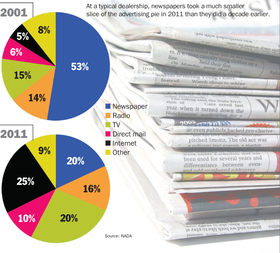 At the typical store, NADA says, newspapers accounted for more than half of total ad spending in 2001. Last year it was just 20 percent. The Internet, in contrast, accounted for 5 percent a decade ago and 25 percent in 2011. But all that lost newspaper advertising didn't go to the Web. TV and radio spots, as well as direct mail, are up as a percentage of the total compared with 2001.